National Wellness Week is Sunday, September 11 through Saturday, September 17. Each day has had a different theme, and PRA staff have gotten in on the fun! PRA staff were asked to share their favorite Wellness Tip! Their answers were compiled into a Flipagram—watch to see their best tips! As Wellness Week falls during Recovery Month, we’ve also been sharing ideas and tips to improve your wellness during Recovery Month! See if any of these ideas resonate with you and implement them today! Occupational wellness is about personal satisfaction and enrichment from one’s work. 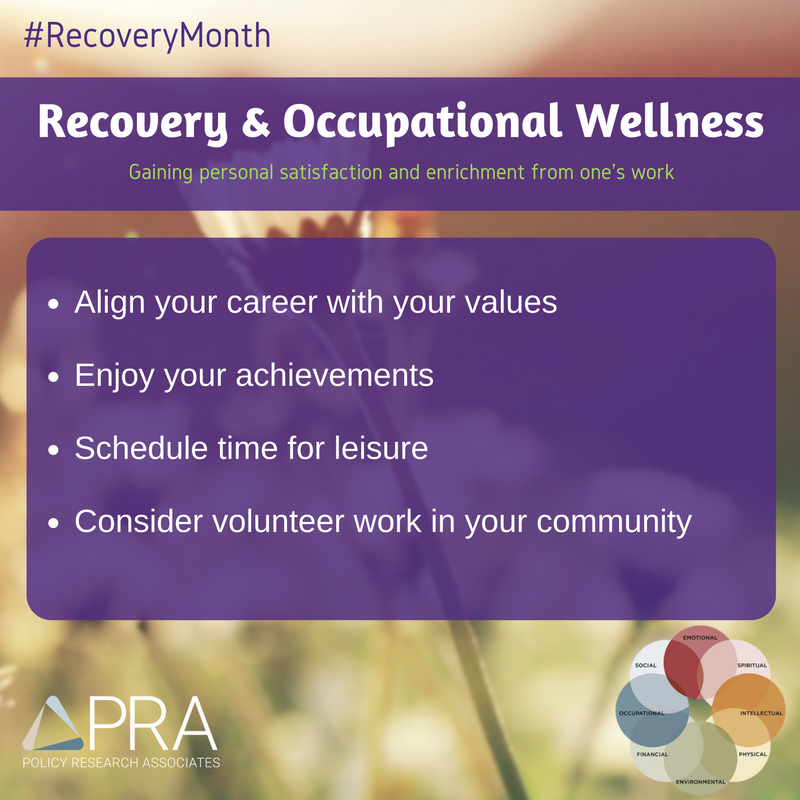 This work can be schoolwork, volunteering, caretaking, community service, the recovery journey, or your employment. 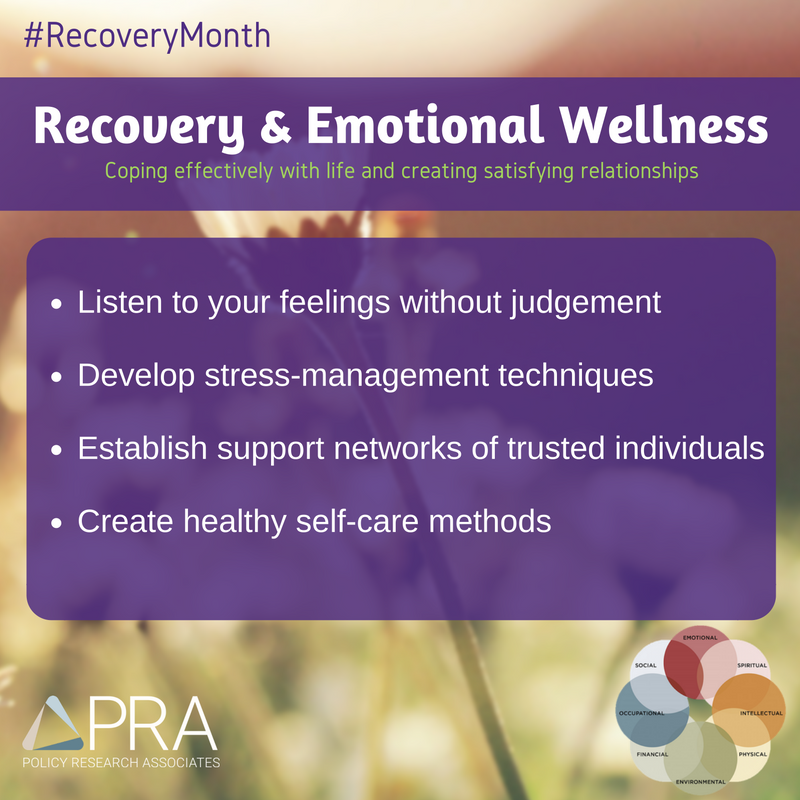 Emotional wellness relates to coping effectively with life and creating satisfying relationships. Financial wellness involves satisfaction with current and future financial situations. This means creating a budget that you can stick to, while planning for future expenses. 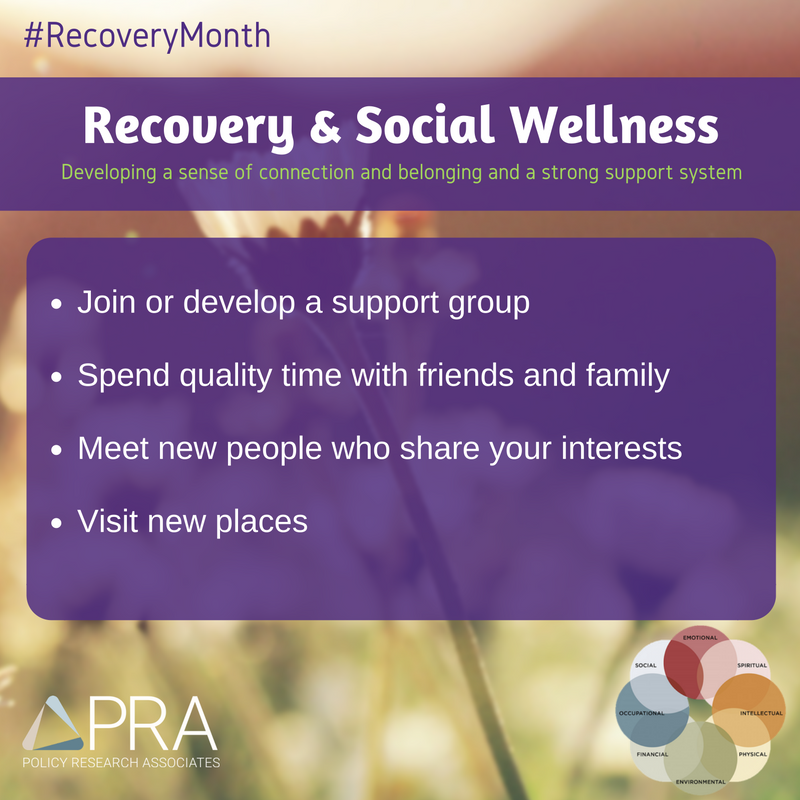 Social wellness is about developing a sense of connection, belonging, and a well-developed support system. Your relationships can be with family or friends—whatever helps you develop a strong network! Spiritual wellness entails expanding our sense of purpose and meaning in life. Some people maintain or enhance their spiritual wellness with affirmations or mantras. Environmental wellness is all about achieving good health by occupying pleasant and stimulating environments that support well-being. New studies are highlighting the role of nature as a stimulating environment that promotes emotional wellness by decreasing stress, improving self-esteem, and boosting mood. Physical wellness isn’t just about nutrition and physical activity. It includes incorporating healthy sleep habits and even regular preventative check-ups with providers into our lives. Remember, all dimensions work together. All of the Dimensions of Wellness are connected. Think about a time when you were feeling very strong in your physical wellness. Did that help you develop some calm and balance that influenced your emotional and even spiritual wellness? By improving your mood, heightened physical wellness might make you more sociable and less irritable, which has potential for improving social wellness. Perhaps feeling strong and healthy in your physical wellness boosted your confidence and focus at work, increasing occupational wellness. The extra energy from increased physical wellness, whether through increased activity, improved sleep, or better eating, might’ve encouraged you to take time for a creative project, focusing on intellectual wellness. 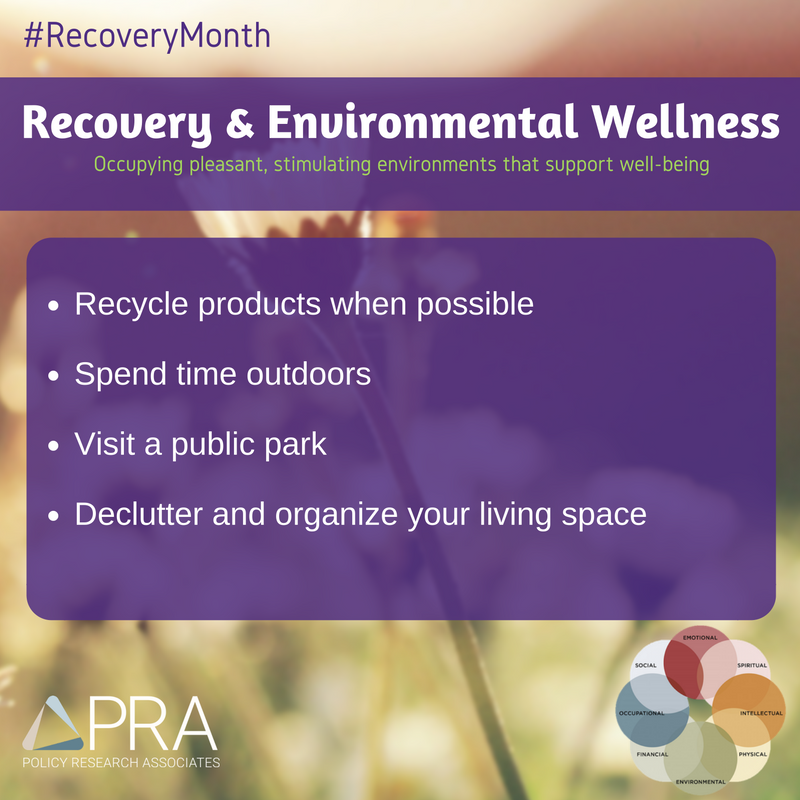 If that energy helped you to get outdoors or even redecorate a room in your home, then it’s improving environmental wellness, too! Or, maybe you used the energy to balance your checkbook, think about your budget, or seek some financial counseling, taking steps to improve financial wellness. All dimensions work together, so take action to improve any dimension today, and watch the impact happen in other areas of your life! Want to learn more? Visit SAMHSA’s Wellness page to learn about the Program to Achieve Wellness and other wellness initiatives!